Over the last few months, Tree House has been experimenting with different styles in small batches. They are well known for their hoppy beers and big coffee stouts, buy lately they have rolled out more traditional German styles. Naturally for the Fall, they had to do an Oktoberfest beer which comes in at a light 5.50% and is brewed with Munich and Vienna malts. Pours a deep amber red with a murky body. Got a finger of off-white head. Aroma contains some dull red grape, lager yeast, dark fruits, and a touch of caramel. The initial flavor I pick up is multi-grain bread followed again by those subtle dark fruits and some very sweet malts. There's also an apple cider tinge or even some apple seeds with grape skin. A crisp lager taste envelopes the taste buds and makes this a refreshing brew for sure. As it warms, the malts take on a toasted flavor which acts like fresh-baked bread. The body is a bit fuller than most Oktoberfests and has more complexity in its flavor as well. No thin or watery feeling and it is an easy-drinker for sure. 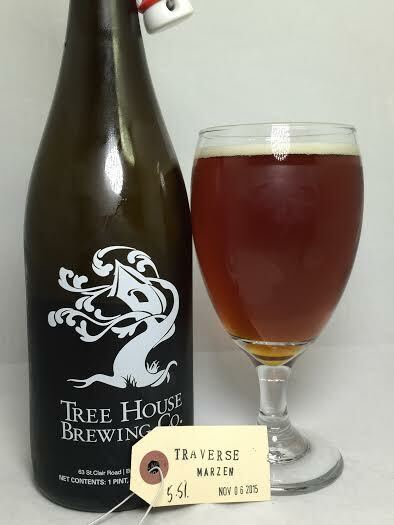 Traverse is one of the better Oktoberfests I've ever had as it doesn't fall into the same old bland taste and smell that characterizes the majority of the offerings from other breweries. If they brew it again next year, I won't hesitate to pick up another growler.